Saunders Landscape Supply offers FREE delivery in Northern Virginia and Maryland. Our lightning-fast system often allows us to deliver firewood the day after it’s ordered. Order online or by phone, and we’ll deliver for FREE to your driveway. Or add our firewood stacking service, and we’ll stack it for you! Is there anything better than a crackling fire when the world outside is freezing and covered in snow? Maybe getting the firewood for that fire delivered FREE to your driveway. Curl up with your loved ones and let your cares melt away in front of a roaring flame. Our Seasoned Mixed Hardwood or Hickory Firewood are top-quality products. We have a strong legacy of 20+ years of award-winning service because we ensure the quality of our products meets the high expectations of our customers. Saunders Landscape Supply works hard to assure a moisture content below 20 percent. Most of our firewood has been split and set out to dry for at least 8 to 9 months. We test the moisture level of it daily with moisture meters to make certain that we do not sell firewood with above 20 percent moisture levels. 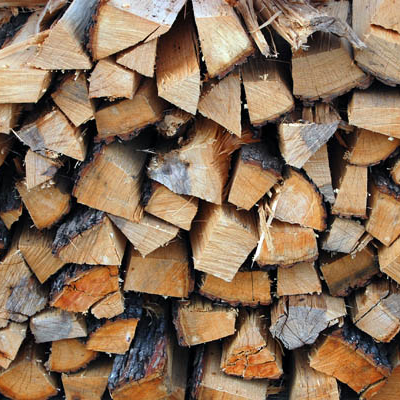 Our Seasoned Firewood is a mixed hardwood of oak, hickory, cherry, maple and walnut. 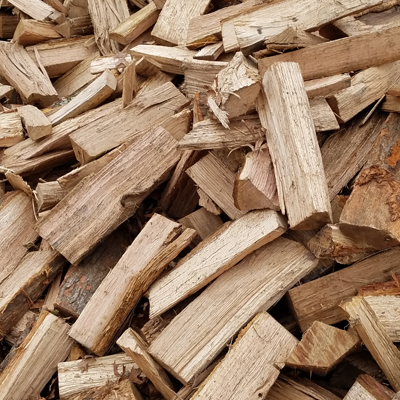 In addition to the top quality of our products, our firewood is inexpensive, is easy to store, comes in a variety of quantities and is much safer than cutting your own wood. It gives you the space heating you require in the winter without the eye-popping bills of heating oil or propane. The Energy Information Administration estimates the average household relying on heating oil will spend $1,392 per year to heat a home. With propane, that price spikes to $1,437 a year. Even the least expensive option the EIA studies, natural gas, comes in at $578 a year! We work hard to make sure our firewood won’t break your budget. Our logistics experts keep our trucks moving at maximum efficiency, so you not only get it delivered for FREE, but also you will likely get it delivered the day after you ordered it. We pass the savings from our efficient delivery system on to you! The temperatures have fallen, and you’ve placed your order for a winter’s worth of firewood. But now you know you’ll have a chore waiting in the driveway when you get home — back-breaking trips back and forth from the wood pile in your driveway to your storage setup as you stack your bounty. At Saunders, we know the last thing you want to do is spend your free time toiling in the cold. That’s why we offer a stacking service. When your FREE delivery arrives, our deliverymen will stack the wood at a location of your choosing within 100 feet of the driveway for a fee. A small fee saves you a ton of uncomfortable work! At Saunders, we’re not just experts at landscaping materials. We’re also experts at transportation and delivery. Our logistics systems run so smoothly that we can get your supplies out to your home often the day after you place an order. For FREE! You won’t have to go without the firewood you need for days or weeks at a time while you wait for another company to get around to delivering your order. In fact, you don’t even have to be at home! You don’t have to take time off to wait for a delivery. Most of our deliveries are made when no one is home. Just mark the spot in the driveway where you would like the product placed, and our experienced drivers will do their best to get it where you need it. Picture a family warming itself after a long day out in the cold. They’ve sloughed off their coats, boots and gloves, and they’re trying to get feeling back in their feet. Where do you see them? Around a fireplace, most likely. The hearth has long been a symbol of warmth in a home. It gives a family a place to gather and relax after a long day and provides a calming presence everyone can enjoy. Do you get that feeling of a cozy home with heating oil? Can you picture a family huddled around a radiator for warmth? Are they happy with that arrangement? It’s hard to think of people happily gathering around the air vent to heat up. There’s an ambiance with firewood that you simply can’t get with any other heating source. You must store it properly if you want to keep it free of pests and safe from moisture. Improperly stored firewood is susceptible to beetle larva. Some beetles even burrow into the wood to seek shelter from the elements during the winter. Carpenter ants and termites also infest firewood if the wood gets wet. To keep your wood safe, keep it at least 6 inches off the ground. This keeps it from getting too wet and makes it harder for the insects to get to. Storing it a few feet away from your home to make sure that you don’t transfer any potential pests from your firewood to your home is a good idea. You should also burn your oldest wood first, since if you have an infestation, it’s likely in your oldest wood. Shake off your logs when you pick them to knock off insects. Heavy yard work can be dangerous, especially for homeowners who don’t normally get a lot of physical activity. Vigorous activity like chopping wood or snow shoveling get otherwise sedentary people out and moving a lot, putting a lot of pressure on their cardiovascular systems. Someone who isn’t physically fit shouldn’t take on intense amounts of work because it puts them at risk of heart attacks. We’ve all seen news stories of people dropping dead while shoveling snow or chopping wood, and the sudden strain of physical activity is why. Andre 3000 of the rap group Outkast lost his father to a heart attack while gathering wood. But you won’t have to worry about raising your risk of heart attack when you order firewood from Saunders. We deliver, FREE, right to your driveway without you having to raise a finger. We will even do the stacking for you for a fee! Chopping wood is dangerous. It requires sharp axes and specific knowledge of safe techniques for felling trees and chopping wood. With a Saunders delivery, you don’t have to risk messing with an ax and hitting your foot or knee. All our firewood is ready for the hearth as delivered. Our cords are cut to similar lengths, and you know that the wood will burn consistently and evenly. We sell a couple variations at several quantities. The individual logs are cut on average to 16-20 inches long, but you can buy a cord, a half cord or a quarter cord. A cord of firewood measures 128 and would be stacked 4 feet by 4 feet by 8 feet. Half cords measure 4 feet by 4 feet by 4 feet and takes up 64 cubic feet. A stacked quarter cord measures 4 feet by 6 feet by 16 inches and requires 32 cubic feet. How much you will need depends on how often you plan on using your fireplace or wood-burning stove. If you plan to run it a few times a week, a cord should work fine. If you plan on heating your home with it, you may want to give us a call and plan for more. If you’re just using your fireplace on special occasions or as a backup heat source in case your primary heat source goes down, you can count on a half cord. The great thing about firewood is you will always need more eventually. We recommend you err on the side of ordering too much, that way you’re certain you’ll have what you need when you need it. We also offer Hickory Firewood. Hickory Firewood is cut to the same length as our Seasoned Firewood. It burns much warmer because Hickory has a higher thermal value than regular wood. Our Hickory Firewood supplies are limited, and it’s only available in Virginia to buyers within 20 miles of Chantilly. We only sell full cords of Hickory. Live in a remote area without great access to utilities? Does your power go out during the slightest storm or lightest powdering? If you feel like your heat might go out during the coldest parts of the year, firewood offers you peace of mind. Even if the electricity goes down, you can keep your home and family warm. A quarter cord stacked in the backyard is like having a second heater primed and ready to go. You won’t get a strong smell from our seasoned firewood, but we do love the flavor. A cold batch of firewood enlivens a home with an aroma of the outdoors as the oaky smells waft through the home and bring to mind memories of simpler times and places. You can reconnect with nature without having to actually brave the miserable cold of a Mid-Atlantic winter. Burning firewood sets a relaxing mood that you’ll find yourself wanting to recreate again and again over the winter.